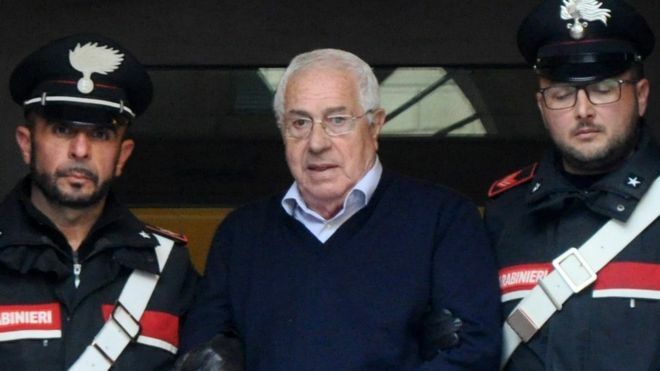 Italian police have arrested the newest top-boss of the Sicilian Mafia. 80-year-old Jeweler Settimo Mineo was arrested in a raid in which 46 were held for offences including arson and extortion. Police dismantled the ‘Cupola,’ the leadership body of the Cosa Nostra crime syndicate. The suspects were accused of bringing back the Cupola 25 years after the arrest of former leader Salvatore “Totò” Riina. Resurrecting the Cupola means that something extremely serious is being planned. The notorious Riina is thought to have ordered the deaths of many people, including magistrates Giovanni Falcone and Paolo Borsellino, who died in Mafia car bombings in 1992. These magistrates had directed a trial, which saw the indictment of hundreds of mafia members. Mineo was elected the “boss of all bosses” in May after Riina died in prison in 2017. Mineo kept a low profile to avoid attention. He used to walk instead of driving a car to avoid police surveillance. The mobsters chose Mineo because he represented the old Cosa Nostra. By choosing him, they also chose the old methods of intimidation, like sending heads of severed lambs to businessmen who refused to pay protection money. Former magistrate Giuseppe Di Lello believes that the Mafia will never accept defeat. Also, every time the bosses try to raise their heads, the authorities block them before they get up. This is because of new technologies, such as telephone tapping and surveillance cameras, which make it difficult for the Mafia to move without being noticed. The Italian police have done a commendable job in arresting Mineo within 2 years of his becoming the boss of the Sicilian Mafia. It must be noted that the top bosses and other mafia members try their best to avoid the watchful eye of the law enforcement agencies. The businessmen who have been extorted for protection money are not likely to testify against the mafia. This is because they fear the mafia. Also, their testimonials may be limited because they might only have come in contact with the foot-soldiers of the mafia. The police have the golden chance of interrogating the 46 arrested members of the mafia. Mineo, being the boss, holds a great deal of information related to the functioning of the Mafia. Despite this, the interrogation methodologies of the day are not sufficient to extract all the information known to the arrested persons. An upgrade of the investigation and interrogation techniques is required in order to keep up with the evolving nature of crime. Law enforcement agencies need an upgraded technology to help deal with interrogation and criminal investigation in an efficient manner. In the case of the arrest of 46 suspects, there is a huge amount of information which can be elicited. But techniques like DNA testing, fingerprinting and polygraph testing are not enough to extract the maximum amount of information possible. Fortunately, there is a savior. This technology is called iCognative. It has been developed by Brainwave Science. iCognative is a scientifically proven technique. It can help the police determine whether the subject of the test is aware of specific information related to planning, committing or witnessing a crime is. Moreover, iCognative is applicable in about 85% of the cases, whether civil or criminal. This is unlike DNA and Conventional fingerprinting which are applicable to at most 2% of all cases. iCognative is based on recording and the analysis of the P300 and P300-MERMER brain response. A computer system and a specialized wireless headset are used to processes brain information. The human brain emits distinct electrical responses when exposed to familiar stimuli. These stimuli can be images, words, and phrases related to the crime. The subject is asked no questions and not subjected to any torture. It is the aim of Brainwave Science to eliminate torture and suffering during the interrogative process. There are no known ways to fool the test. Also, the test reports no false positives or false negatives. The investigators can gather valuable evidence regarding the organisational structure of the mafia, and the rank of each of the captured suspects in the organisation. Evidence gathered from phone tapping and surveillance can be used in the iCognative test protocol. iCognative is accurate to a degree of more than 99%. Because of this characteristic, it helps to not only put the guilty behind bars but to also help exonerate the innocents. It helps to solve a crime which and also holds the power to uncover plots. Since the outcome of the test does not depend on the opinion of the test administrator, this test is highly reliable and is thus admissible as a scientific evidence in the US courts. It is amazing that such a revolutionary technology is portable, easy to learn and easy to use. It is thus advisable to use iCognative in all cases where evidence is available. iCognative has been made possible by the combination of years of experience of innovators and executives. iCognative is the tool which the Italian Police need not only to confirm the level of involvement of each of the arrested suspects but also to reverse-engineer the rest of the Mafia and bring it to its knees.